The article by Cohen, a senior at Northwestern University’s Medill School of Journalism, explored a topic not often covered in the B2B magazine industry: transgender models on the runway, and was intended for a publication called The Cut. For the piece, Cohen interviewed a transgender model, who revealed the challenges of working in the fashion industry. Cohen also researched the history of the transgender modeling industry for the article. When given the opportunity to write about any topic of her choosing, she says she has always leaned toward the fashion world or LGBTQ+ rights. Cohen, who is majoring in journalism and minoring in theatre studies, is pursuing a certificate in integrated marketing communications and plans to graduate in spring 2019. The AEJMC/ASBPE Foundation also honored three other students in the competition, all of them also from Northwestern’s Medill School. The second place winner, Virginia Nowakowski, wrote a story titled “Teaching for Real,” for a publication called Education Week Teacher. This story brought the topic of student teaching to life through interviews with student teachers and an instructor. While still enrolled in a university, students have the opportunity to partner with teachers to run a classroom in a local school district to practice their skills and improve their techniques. Charlotte Hu earned third place for her article, “Duck, Duck, Organic Goose!” The story, which was written for a target publication named Specialty Food magazine, covers the topic of meat consumption in America and the health, welfare and treatment of the animals. 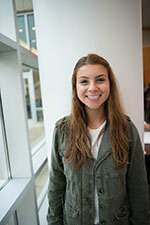 Finally, Elena Golub won a honorable mention for her story, “Overstuffed” for the target publication, College Parent. This story focused on a new campus dining plan at Northwestern University and the cost of skipping meals and eating off campus rather than in the dining halls. Amy Fischbach, president of the ASBPE Foundation, says she is proud to recognize the student writing award winners. She worked with past ASBPE Foundation president, Roy Harris, to select the honorees for 2018.